I love a good scone and pumpkin flavoured ones are no exception. This month’s Australian Better Homes & Gardens magazine featured a recipe for Pumpkin Scones which looked both simple and delicious. I was right on both counts. 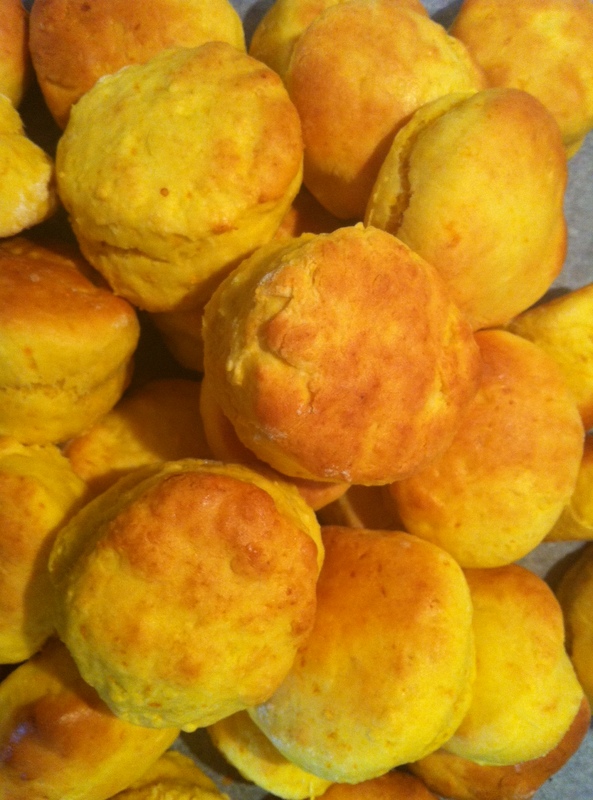 The recipe below makes 9 scones but I doubled it because – well, 9 just isn’t enough! 1. Preheat oven to 220 degrees C and line an oven tray with baking paper. Put butter and sugar in a large bowl & beat with a whisk until light and fluffy. Add egg & pumpkin, stir to combine. Sift flour and salt into mixture and mix. Add milk gradually, stirring to form a loose dough. 2. Turn out dough onto a lightly floured surface and gently knead to bring together. Use the palm of your hand to flatten out dough to around 2cm thick. Using a 6.5cm scone cutter dusted in flour, cut out 9 rounds (bringing scraps together and re-flattening if necessary). 3. Put rounds on prepared tray, so no sides are touching. Brush tops with extra milk. Bake for 15 minutes or until light brown. Halve and spread with butter to serve. I love these pumpkin cakes!! Pumpkin is a great vegetable! Yum! I haven’t had a pumpkin scone in ages. Must rectify soon! I definitely trust those country ladies when it comes to baking! Oo, those look so fluffy and delicious! Yummm. Thanks Allison – they went pretty quickly!